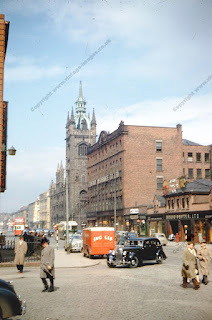 The Past in Colour: The first post........Back to the Fifties! This is the Blog of www.vintage-images.co.uk where I hope to showcase some vintage colour images and encourage feedback to help identify some of the slides that came unanotated or mis-described. 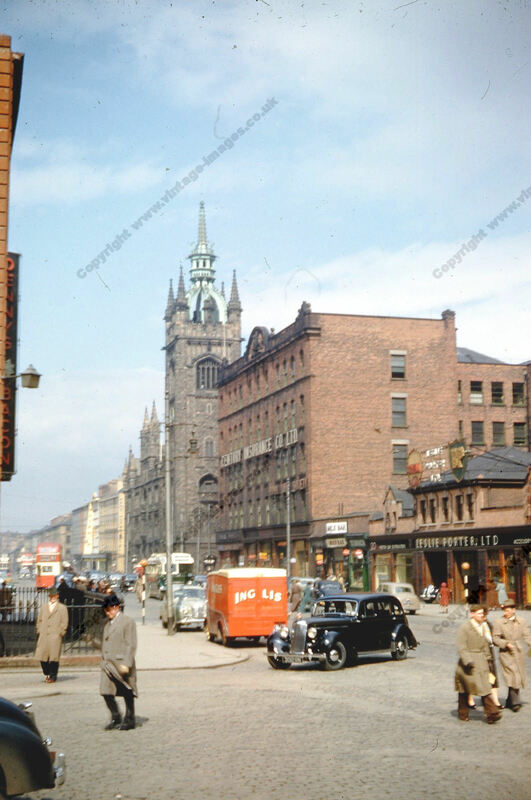 In this slide we go back to the 1950s in glorious Kodachrome in an image that puports to be of Edinburgh (but isn't) in 1953. There is just a hint of camera shake, not surprising with a film speed of only around 8ASA. Leslie Porter is the garage company in the building on the right, under the huge Shell and BP advertising signs and next but one to the Milk Bar. The red van is run by Inglis, who are proud of their Quality Biscuits (which can JUST be read on the original), the large brick building is home to the Century Insurance Company. There is a single deck half cab bus in green and cream and two double deck buses in a red and cream livery in the background. I have also been advised that the livery of the Buses is appropriate for Belfast which also had an Inglis Bakery, but the exact location is still a mystery. The tower may be a town hall and is fairly distinctive so it may be easy enough to identify if you know, but quizes are always easy when you know the answer. I hope to update this blog fairly regularly with images from all over the world from 1909 through to the early 1970s in unpublished colour. From the streets of New york in the 1940s to Parisian street cafes in the 1950s and even 1970s street scenes that have changed out of all recognition.